Below is an excerpt from an article by Keith W. Medley (author of We As Freemen: Plessy v. Ferguson) about the organizing by the Comité des Citoyens that led to Plessy v. Ferguson. It is a powerful story of organizing, fundraising, the use of the media, legal strategies, and more. Regardless of the outcome of the court case, the Comité des Citoyens played an important role in U.S. history. 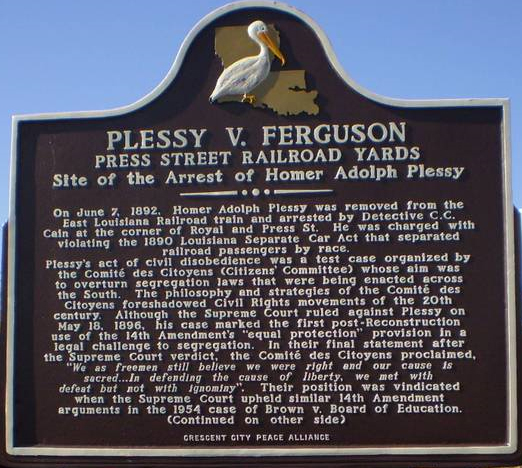 Front of Plessy v. Ferguson marker in Louisiana. Click image to view a larger image. Louisiana Legislature’s Separate Car Act in 1890 decreed “equal but separate accommodations for the white and colored races” on Louisiana railway cars. It was the passage of this bill that finally launched Homer Plessy into history. The fight involved a black newspaper, The Crusader, the six remaining black state senators and ultimately the Comité des Citoyens, which coalesced around The Crusader. 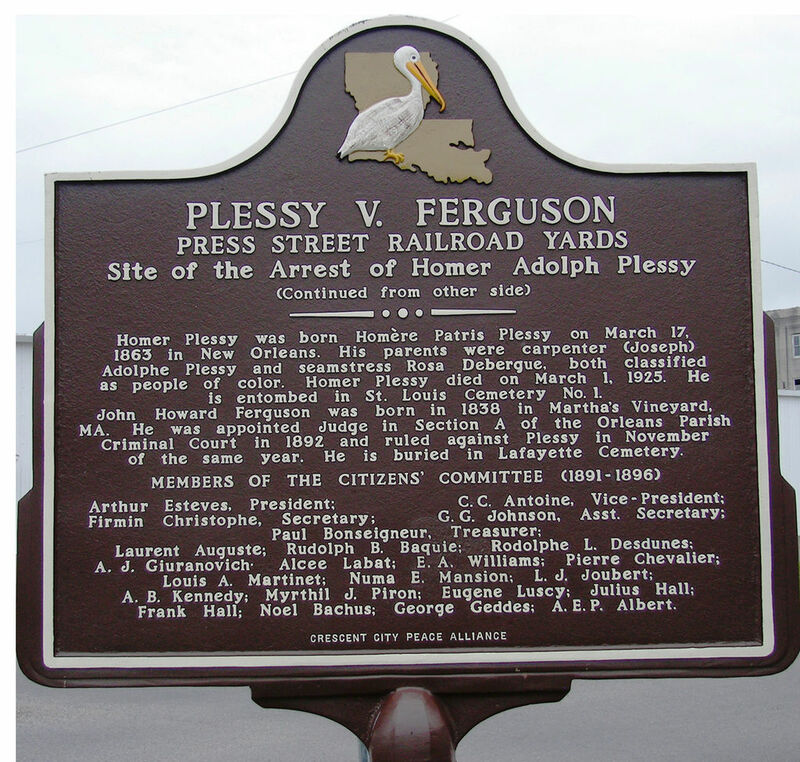 Back of Plessy v. Ferguson marker. Click to view a larger image. The Crusader’s star contributor was Rodolphe Desdunes. The son of a Cuban mother and a Haitian father, Desdunes worked as a customs agent by day and, with smoking pen, scribbled polemical columns by night. Hundreds of his articles, still preserved in the archives of Xavier University in New Orleans, offer a window into the desperate fight to keep civil rights from slipping away. 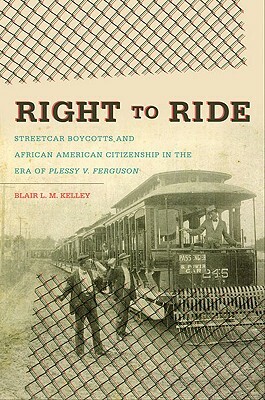 “Colored people have largely patronized the railroads heretofore,” Desdunes wrote on July 19, 1890. “They can withdraw the patronage from these corporations and travel only by necessity.” He proposed a boycott, not unlike the one launched in Montgomery, Alabama, 70 years later. To combat what became known as the “Jim Crow car law,” The Crusader and the Comité des Citoyens acquired a small but influential membership. It involved C. C. Antoine, a former officer in the Union Army, who had served four years (1873-77) as Louisiana’s lieutenant governor, and wealthy philanthropist Aristide Mary, who had financed lawsuits against other resegregated establishments. It was a forlorn hope, but not as forlorn as it would become in the slow process of going through the legal system. For one thing, on the face of it, if you gave any thought to the intent of the men who wrote the 14th Amendment, the Separate Car Act seemed a clear violation of the constitutional rights of the black citizens of Louisiana. But public opinion in the North had changed rapidly, and so, in the years after 1877 had the makeup of the Supreme Court, which lost its reasonable mix of justices sympathetic to the subject of civil rights. Some railroad companies initially had been against the bill. It was going to cost money to build and run extra cars—for the bill implied that if a half-empty “white” car was waiting, and even if only one black passenger showed up, he or she would have to have a whole separate-but-equal vehicle made available. In a city that had for so long seen so much racial mixing, railway conductors would now have to decide who was white and who was black—a touchy business, especially since some wives and husbands would not be allowed to ride together. One of the reasons that Homer Plessy was picked for the job [of creating a test case to fight the law] was that he had fair skin. Had it been left to chance, he probably could have ridden the train in the “whites only” section unnoticed. 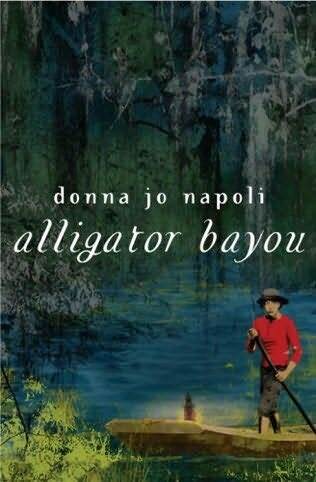 But by prearrangement between the Comité and the East Louisiana Railroad, everything was ready for him when he came. On June 7, 1892, Plessy strolled to the Press Street depot, which included a restaurant and a combination waiting room and ticket office (both still open to him), bought a first-class ticket and, ignoring the new “Colored Only” sign, sat down in the coach reserved for whites. It was to depart at 4:15 P.M., cross a bridge spanning Lake Pontchartrain and pass through Abita Springs for a two-hour run to Covington. When Plessy again refused, he was taken a half-mile down to Elysian Fields Avenue for booking at the Fifth Precinct Station. Members of the Comité met him, and a judge released him on temporary bail. 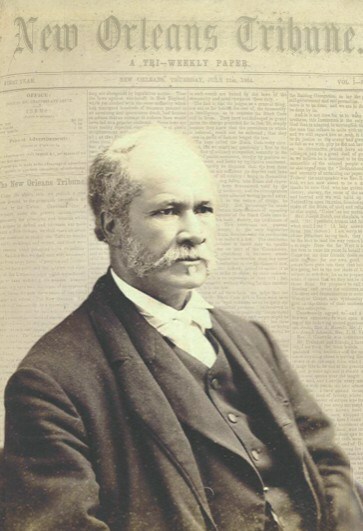 The next day a story in a New Orleans daily described Plessy as a “snuff-colored descendant of Ham.” After a hearing, Comité member Paul Bonseigneur plunked down a $500 bond (raised by putting his own house in hock) to guarantee Plessy’s appearance for trial. Plessy was 30 years old. The future of constitutional rights for blacks in America would ride on his day in court. © Keith W. Medley. Reprinted here with permission from the author. 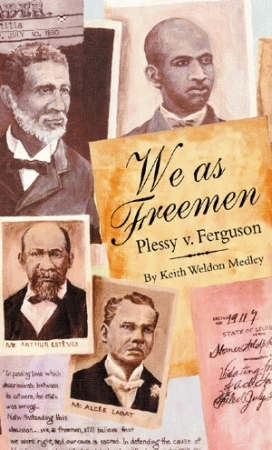 Excerpted from an article he wrote for the Smithsonian Magazine and later developed into the book We As Freemen: Plessy v. Ferguson. Plessy v. Ferguson court ruling from Our Documents website.